We would like to welcome you to our website. We actively encourage the involvement of our parents and community partners in the life of the school. We promote an ethos of love, respect, and achievement, inspiring all learners to do the best they can. We currently have 8 primary classes and a nursery class. We moved into our new building in October 2013 and final work was completed in May 2014. Our new excellent facilities provide a bright and inspiring learning environment for everyone. 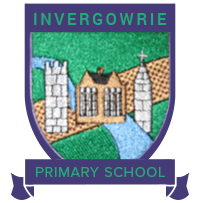 Invergowrie Primary School is the first in Perth & Kinross to feature an extensive green roof which hosts a variety of flora and fauna to support the biodiversity of the site. We are all delighted to be finally all under one roof! You have shared good practice with other schools internationally via your participation in the Comenius project. Great work everyone. Well-deserved congratulations on an amazing team effort. Please visit our Eco committee page to read more.